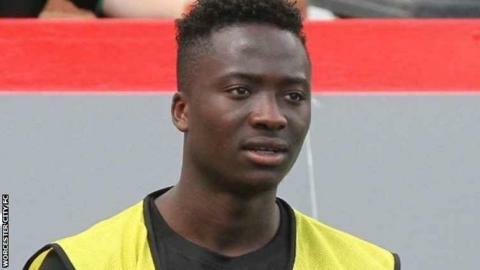 Teenage Crewe Alexandra striker Daniel Udoh says making his league debut was a "dream come true" and has made him determined to seize his opportunity. The 19-year-old, signed from non-league Ilkeston, played the last 20 minutes of Monday's 1-0 home defeat by Bradford City. "I'm delighted," Udoh told BBC Radio Stoke. "I just want to get my head down and hopefully I can get a start. "I'm going to grab this opportunity and I'm not going to let it go," he said. "The intensity is higher and the mistakes are less. I'm not quite there fitness-wise but I'm sure, over the next couple of weeks, I'll be up with the rest of the boys. "Making my league debut is a dream come true - I've always been working hard to get to that day." Although Crewe appear to have only an outside chance of avoiding relegation from League One, 11 points adrift of safety with only seven games left, Udoh says their position in the table has not affected the spirit in the squad. "The team's quite good," he said. "I don't think we deserve to be at the bottom - but we have to face it. "This is just the start for me. I want to be more stabilised next season and ready to go."